NOS announces the solicitation for nominations for 2020 HSRP members. Nominations are due MAY 1, 2019, for a four year term that starts January 2020. To be announced at the end of June 2019. The HSRP Federal Advisory Committee public meeting will focus on topics related to navigation services. There will be updates from the three HSRP working groups (WG) including the Planning and Engagement WG, Technology WG, and Arctic Priorities WG, review and discussion of proposed priorities for the HSRP, issue papers and recommendations to NOAA, comments and suggestions regarding regional, state and national priorities. There will be updates from the National Ocean Service program offices related to navigation services – National Geodetic Service, the Center for Operational Oceanographic Products and Services, the Office of Coast Survey as well as the University of New Hampshire’s Joint Hydrographic Center and Center for Coastal and Ocean Mapping. The agenda times and speakers are subject to change so please reference the most recent draft online. The HSRP is seeking public comments on the value of NOS products, and to offer recommendations to improve NOAA's navigation data, services, and products. Comments related to navigation services are encouraged and welcome in advance, in person or via the chat function during the webinar. Please send your advance letter or comment to hydroservices.panel@noaa.gov, Virginia.dentler@noaa.gov, and Lynne.Mersfelder@noaa.gov. It will be noted and entered as part of the public record of the meeting. The HSRP agenda, Federal Register Notice, speaker presentations, speaker biographies, meeting documents, and other information will be posted in advance of the meeting at: https://nauticalcharts.noaa.gov/hsrp/meetings.htm and https://nauticalcharts.noaa.gov/hsrp/hsrp.htm. The HSRP is a federal advisory committee that provides NOAA with independent advice on improving the quality, efficiency, and usefulness of NOAA's navigation-related products, data, and services. The HSRP advises the NOAA Administrator about its navigation (i.e. nautical charts and ENCs), physical oceanographic (i.e. tides & water levels), geospatial, positioning, and shoreline programs, products, and services. There are two public meetings each year in different port regions at which we seek public comments from stakeholders and partners. Lynne Mersfelder-Lewis, HSRP program manager, NOAA National Ocean Service, Office of Coast Survey, email: Lynne.Mersfelder@noaa.gov. Virginia Dentler, NOAA National Ocean Service, Center for Operational Oceanographic Products and Services, email: Virginia.Dentler@noaa.gov. 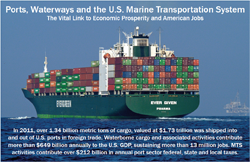 Ports, Waterways and the U.S. Marine Transportation System--The vital link to economic prosperity and American jobs. In October 2003, Secretary of Commerce Don Evans established the Hydrographic Services Review Panel as directed by the Hydrographic Services Improvement Act of 2002, Public Law 107-372. The Panel is composed of a diverse field of experts in hydrographic surveying, vessel pilotage, port administration, tides and currents, coastal zone management, geodesy, recreational boating, marine transportation, and academia. Advice from this panel will assist in addressing NOAA’s strategic plan to improve the nation's marine transportation system and NOAA’s plans to support commerce with world-class products and services that will help ensure safe, efficient and environmentally sound marine transportation.